Shortly after this photo was take of our amazing and cheap and chips meal (literally 3.50 for all of us) I picked up chilli to add to my amazing wonton noodle soup (shock horror!) and then blew my noes, just touching my noes so for this entire meal just under my noes was on FIRE and Olivia had to go all mother-like on me so that I stopped touching it and making it, if it was even possible, worse! 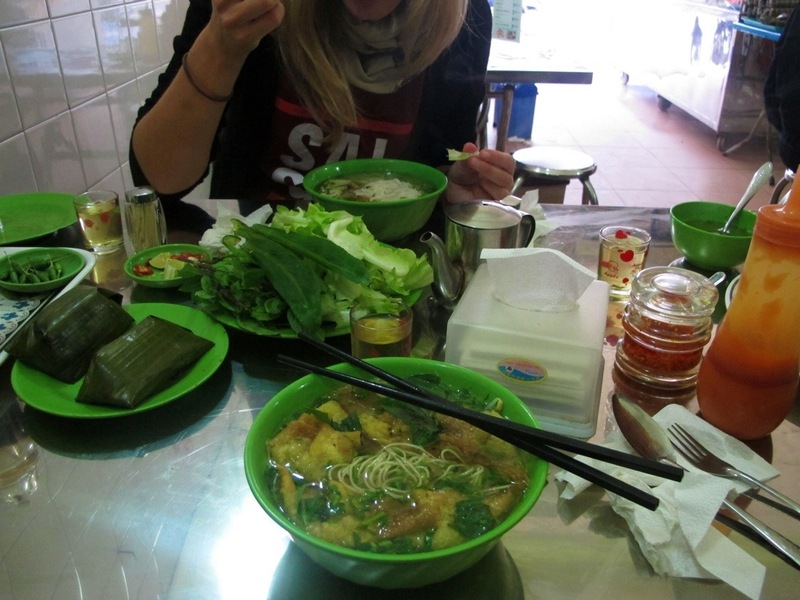 This cafe has been our budgets saviour here, we’ve returned at least 4 times since bing in Da Lat, and who wouldn’t when you can get $1.50 plates of piled high (unusual) Vietnamese vegetarian goodness, $1 soups and 4 fresh vegetarian spring rolls for 50 cents. Winners are grinners!